WHAT A DIFFERENCE A GARAGE MAKES! Garage cabinets are a must for better organization and proper storage. Custom garage cabinets are the best choice to fit a client's special needs. But which company, who and how to find the best for your investment. The most important and primary component is the quality of the material. In full exposure, we offer a high quality melamine that is US made by "American Laminates." The short story is that it is denser than cheaper brands and will with-stand many years of usage. The other company may or may not even know what they are using, basically, what ever is cheapest. Although this phrase is sometimes credited to Benjamin Franklin, the Oxford Book of Quotations dates it back to the 17th century. No doubt you heard it as a child, probably as your mother encouraged you to clean your room. I can still hear the Sisters of Mercy at St. Apollinaris singing it over and over as we students tidied up our desks and the classroom. It’s such a simple, logical, healthy, and beneficial notion, no wonder it has lasted throughout the ages. 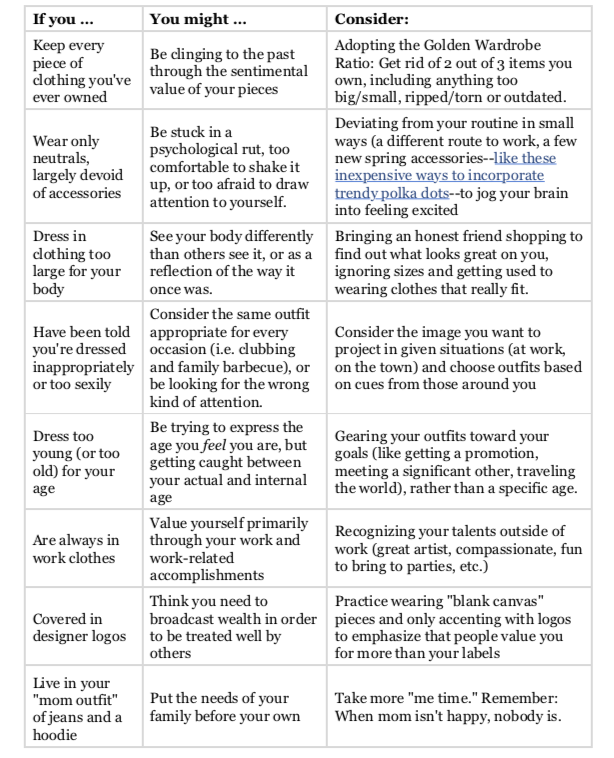 Over the years, I’ve written several columns advocating the idea of surrounding yourself, your home, with things that you love, use, or have special meaning. This not only makes your environment more pleasant and attractive, it makes daily life easier. You can select your wardrobe more quickly, prepare meals more quickly, pay your bills more quickly, and find whatever you’re look for more quickly. You’ve not only decreased needless stress and aggravation but have increased cherished time in your day. But, like a diet, such an ideal circumstance can be difficult to achieve and even more difficult to maintain. My hunch is that most people declutter and donate once or twice a year. It always feels good to lighten one’s load. But there’s a subsequent step to this process. It’s where Benjamin Franklin’s wise words come into play. In order to sustain all that you’ve just achieved, what remains should have their own space. Their place. In many cases, this means designated rooms, closets, shelves, drawers, bins, and cubby holes. But creating storage is more than just making room for your belongings. It’s an art. It should be designed carefully with the thought of organization, timely routine, function and usage in mind. Key ingredients to this art are categorizing and grouping like items together. That is, instead of stacking books on desks, coffee tables, and bookshelves, create a single library. Instead of separating jewelry in boxes and baskets in dressers, bathroom counter tops, and nightstands, designate a single drawer or two (with inserts and dividers in specific sizes) for all your pieces. Instead of scattering cleaning supplies in bathrooms, kitchen, and the garage, store them all in one place. Why does this strict, and possibly uncomfortable, strategy work? Because it ends the guessing game. When looking for a book, a bracelet, or a broom, you’ll know exactly where to go instead of searching in various locations. Even if your home was built with several closets, they are most likely not configured in an optimal way. There are many aspects to designing functional, attractive, and well-made storage with value-added bells and whistles. Since it’s not only an art but a science, I call on professional closet, cabinet and storage designer, Malka Sabroe-JoHanson, to help my clients. Sabroe-JoHanson stands apart from other closet designers because of her background in interior design, her 25-year experience, her insistence on working with quality materials, and complying with all relevant building codes and standards. She understands the concept of form and function and individual needs in diverse settings. She has clever solutions for each. She knows how to maximize space and a client’s budget. “A dream closet does not have to be expensive and or extravagant. It simply needs to be designed for a client’s specific needs and desires,” Sabroe-JoHanson said. Consumer Affairs Department. Its long- established craftsmen are experienced in fine cabinetry and finishing work and adhere to the guidelines of safety and codes in the State of California for lasting construction. Sabroe-JoHanson’s process begins with a consultation, which is followed by a presentation of detailed, computer- generated drawings. All cabinetry is custom and without pre-fabricated parts, and all work is warranted. To see her portfolio and to read her informational blog, visit RCCabinetsandClosets.com. She can also be reached at (707) 688- 2791. Patti L. Cowger is a credentialed, award- winning Napa-based interior designer and owner of PLC Interiors. For more information about her design services, visit her website at plcinteriors.com call (707) 322-6522; or email plcinteriors@sbcglobal.net. After 25 years in the closet and cabinet business, I can certainly attests to have seen - the good, the bad and the ugly in closet designs. Far too many poorly designed closets have actually detracted from the homes’ worth and I have been hired to make over these wasted spaces through out the years. To assist home owners in their choices, I have outlined the essential rules in hiring a designer to create their dream closets and make the process a more pleasurable undertaking. 1.) Hire a Professional qualified Closet Cabinet designer with several years of experience and with a knowledge of construction, space planning, garment size requirements and design. Ask for local references and / or ask neighbors and friends for a referral. 3. 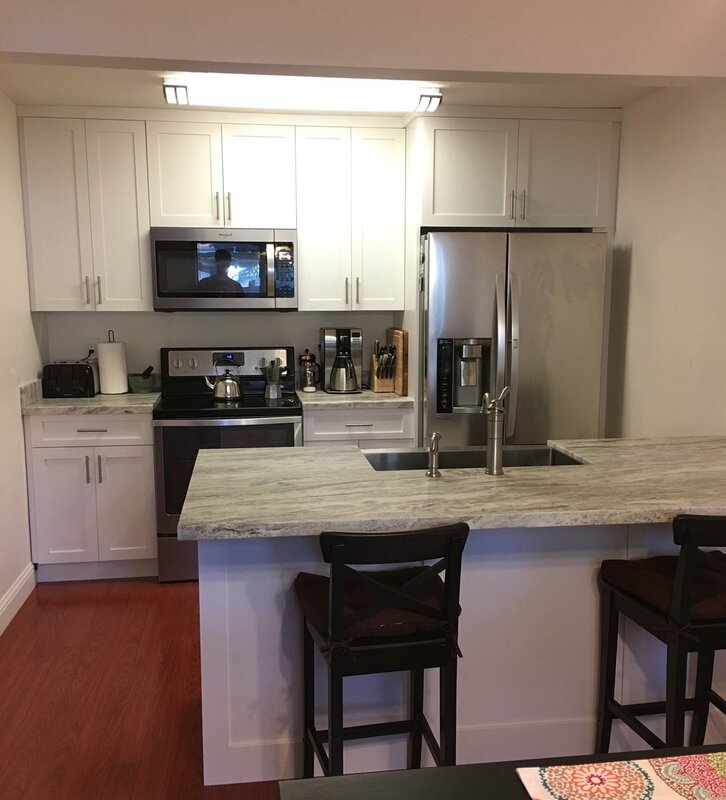 *In the state of California, a cabinet shop must hold a current, valid specialty license to install the cabinetry; California State Contractors license: Cabinets & C-6 - Cabinet, Millwork and Finish Carpentry Contractor and must have Workman’s Comprehensive Insurance for their employees and Insurance Bonds. All work must be supervised by the licensed contractor in the performance of the manufacturing and installation. Check with your residing state’s construction laws and always verify the status of their license and the correct owner. Their license is required to be posted on their website, contract and business cards as well as any advertisements. 4. The cabinet contractor should offer a warranty which must be printed on their contract. 6. The designer should present drafted plans that are clear, fully detailed with measurements and sizes to scale and easy to understand. It is preferable to be an AutoCAD, computer generated diagram for precise and accurate detailing. 7. The contract should clearly specify all materials to be used such as the quality, color, size and brand name as it may apply. The contract must be legible and easy to understand. 8. * A down payment of 10% or $1,000, whichever is less is the only deposit permitted in California. The remaining progress payments are allowed and required for ordering materials by the shop to perform the job. 9. * Any changes made to the contract and / or the closet plans must be in writing as a “Change Order” and approved by you the client. 10. ** Look for value in a closet cabinet pricing. Be cautious of false sales promotions and “Price Reduction” deceptive discount coupons that are aggressively timed. A coupon or sale running more than three (3) months is not a sale, it is a false advertising. Offering a sales discount or reduction is a common sales technique. The sale price is misleading unless the former price is the actual, bona fide price at which was originally offered as. 11. Most importantly; the designer must work closely with the client and respond to their special requests, concerns and desires. 12. * When requesting a Bid on the closet project, it is suggested to get three bids on a design. Three different closet designers will have three different design plans therefore if a proper bid is requested, you, the client must provide accurate plans or drawings of the closet spaces to the three specialty cabinet contractors that will enable them to determine the scope and cost of the work. Again, the client must supply their own accurate plans to determine the exact scope and cost of the work. Each of their proposal contracts should clearly specify all materials to be used such as the quality, color, size and brand name as it may apply. Each contract must be legible and easy to understand. Each of the three cabinet shops should hold a valid specialty license to install the cabinetry; California State Contractors license: Cabinets & C-6 - Cabinet, Millwork and Finish Carpentry Contractor and must have Workman’s Comprehensive Insurance for their employees and Insurance Bonds. Neat and tidy shelves, all bins and boxes beautifully organized in a row. 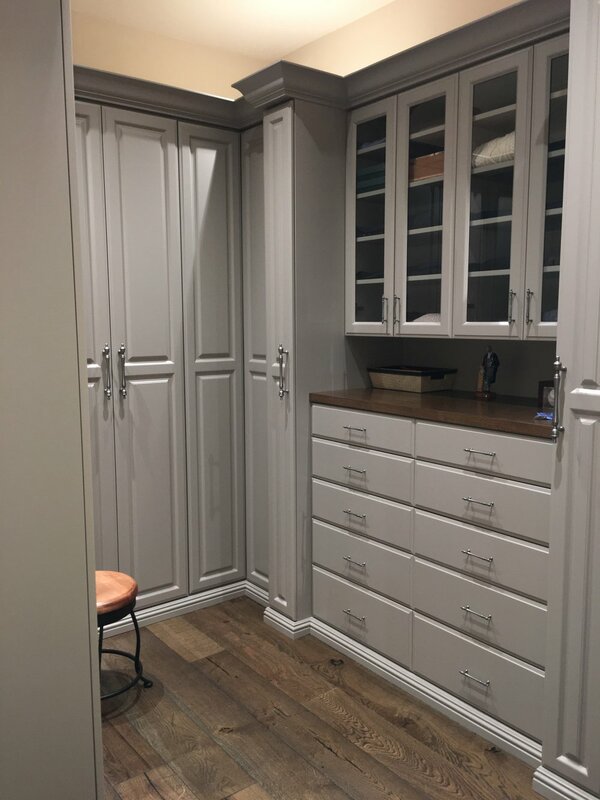 Walk-In Closet - The focal point of this closet is the purse cabinet with custom painted lusterous chrome trim with white melamine. LIVING ROOM CABINET, CUSTOM DESIGNED FOR THE ENTIRE WALL CREATING A PEACEFUL SITTING AREA AND DISPLAYING CLIENT'S ARTFUL COLLECTABLES. 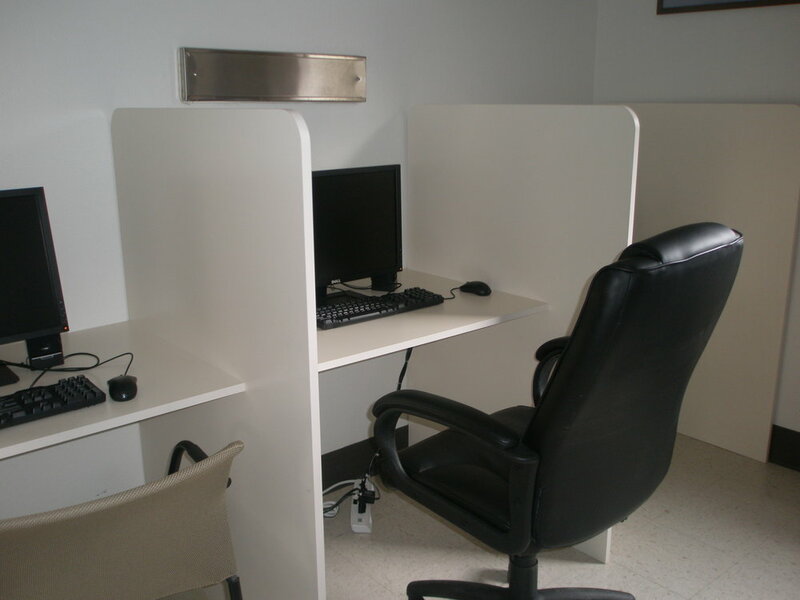 We designed and installed the cabinets for the new intake center, offices and conference rooms in 2009. Formally called California Transition Center for Care of Combat Veterans, it was a supportive haven for the vets coming back from the war with PTSD. It certainly is an idyllic setting tucked away on a hillside in the vineyards of Napa Valley. Beautifully constructed Cherry Wood Home Office, specially well organized to store bedding and bed as well as plenty of office supplies.